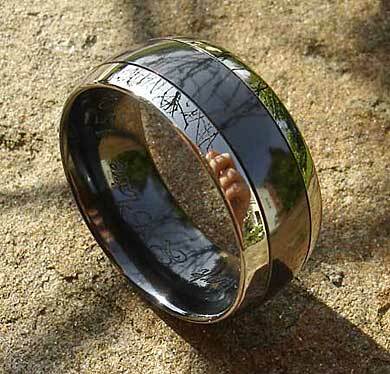 Men's Two Tone Domed Wedding Ring : LOVE2HAVE in the UK! 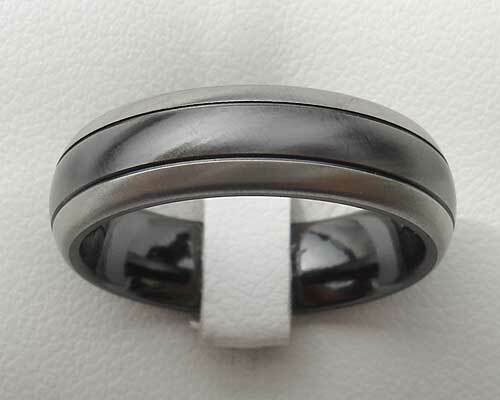 A domed profile zirconium men's wedding ring with a grooved black centre that is flanked by natural coloured edges. It is available in different widths and in a satin or a polished finish too. The widths range 5mm all the way to 12mm, and we have some of these pictured here. We love this straightforward but incredibly stylish modern design. As explained elsewhere on our website, Zirconium is a metal that can be heat treated which turns its natural grey colour to black. 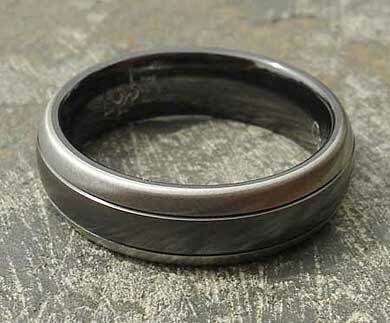 After the heat treatment process is complete, the ring is all black. The black is a surface that then needs to be skimmed away to reveal the original natural colour below. This skimming can be machined very accurately allowing the designer to create some fantastic two-tone designs for our zirconium rings. The contrasting colours, therefore, make great wedding rings.